KUALA LUMPUR, Malaysia — Malaysia's human rights commission has urged the government to reinvestigate the disappearances of a Christian pastor and a Muslim activist after a public inquiry concluded they were abducted by the police special branch for alleged proselytizing of Muslims. Amri Che Mat, who ran a charity group, disappeared after leaving his home on Nov. 24, 2016. Pastor Raymond Koh disappeared in central Selangor state on Feb. 13, 2017, while being investigated over alleged proselytization. The National Human Rights Commission concluded Wednesday after a two-year public investigation that direct and circumstantial evidence showed the men were victims of "enforced disappearance by state agents" involving the special branch. It said the men were targeted by religious authorities and police and had been abducted in similar ways: Their cars were blocked by several four-wheel drive vehicles before they were swiftly seized by men in black wearing ski masks. It said Amri was under the watch of Perlis religious authorities for allegedly spreading Shiite teachings. The government recognizes only the Sunni branch of Islam and prohibits all others including Shiites, the world's second-largest Islamic group. 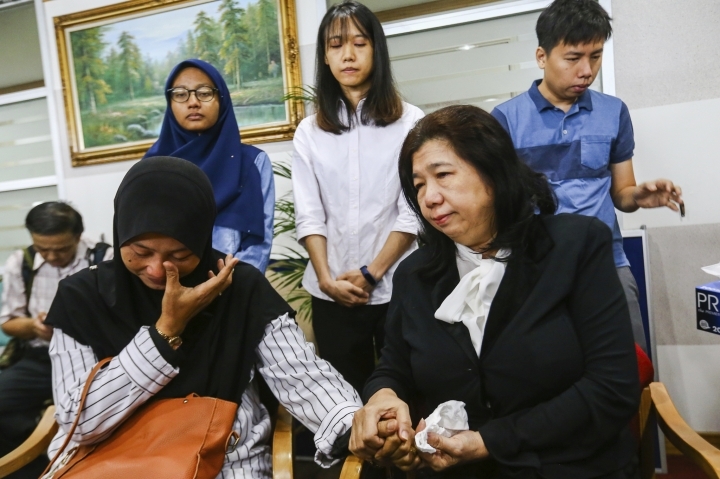 The findings have stunned Malaysians and prompted calls by rights groups, lawmakers and a Christian organization for a new investigation to find the truth and punish the perpetrators. The inquiry cannot take action and can only make recommendations to the government. "After the (commission's) damning conclusion, the government can no longer bury its head in the sand. An independent and impartial investigation into the special branch's involvement ... must be immediately undertaken in order to determine (Amri and Koh's) fate or whereabouts," said Sevan Doraisamy, executive director of rights group SUARAM. The National Evangelical Christian Fellowship said the government must reopen the investigation into the "heinous injustice" against the two men and that police cannot be allowed to violate the rule of law. In addition to Koh, Muslims-turned-Christian preachers Joshua Hilmi and his wife Ruth Hilmi disappeared mysteriously six days after Amri in 2016. The commission said it hopes to conduct a public inquiry into the Hilmis' case too. "These kidnapping have raised fears of religious vigilantism in the country," said lawmaker Charles Santiago, who described the commission's findings as "chilling." Santiago and another lawmaker, Ram Karpal, called for the suspension of national police chief Mohamad Fuzi Harun, who was head of the special branch at the time. Other civic organizations and a group of former civil servants demanded that the government set up an oversight body to ensure that police are accountable and to regain public trust. Prime Minister Mahathir Mohamad told reporters late Wednesday that the government will reinvestigate the disappearances if the rights commission has evidence to back up its findings, not just hearsay. He noted that the disappearances occurred under the previous long-ruling coalition that was defeated in last May's election. Mah Weng Kwai, a retired judge who headed the inquiry, said Thursday that the government must prove that police were not involved. He said the inquiry was handicapped by police reluctance to cooperate, but that circumstantial evidence in both cases strongly pointed to police involvement, which he described as "heinous and despicable." Mah said his three-member panel had done "sufficient fact-finding" to warrant a further government investigation. Mahathir has said that Fuzi, who is due for retirement soon, will be allowed to do so and that a new police chief could investigate him later. Fuzi has declined to comment. The former home minister in charge of police, Zahid Hamidi, denied ordering police to abduct the men. Former national police chief Khalid Abu Bakar denied that the special branch was involved.